I recently had the opportunity to test out three products from the L'Oreal Paris Extraordinary Oil Curls product line for free. I used it alone and in conjunction with other products to see how well Extraordinary Oil works in my curly life. There are some good and bad aspects about these products I will tell you about now. You will immediately notice the smell of the shampoo – the same goes for all of the products -- as soon as you open it. They are intensely perfumed. This does not bother me. I think those sensitive to fragrance should steer clear of this line completely. You won't be able to handle the smell. I have a major gripe with this shampoo, it contains sodium laureth sulfate (SLS). If you are serious about curl-care any SLS containing hair care product will be off your list. I honestly believe in this day and age there is no reason for curl shampoos to not be SLS-free. It is not as harsh as many shampoos containing SLS but I know how my scalp is, it cannot take many washings with such a product. I am in love with this conditioner! Sure it does have a strong fragrance but once it is rinsed, the fragrance lightly lingers. Since I am not sensitive a fragrance, this is not an issue for me personally. This conditioner reminds me of Carol's Daughter's Tui Conditioner. My hair responds to it the same. My coils spring back to life and are not weighed down. In fact, I don't think I will be buying CD's Tui Conditioner anymore. Thank you L'Oreal Paris, you are saving me $9.00 month! I like this conditioning mask. It is not the best I've used. It is a close second. I will still pay more for my current mask. If you use the shampoo from this line, this mask works best as a pre-poo with an oil for your scalp. If you just use olive oil with this, it is a cheaper alternative to CD's Olive Oil Infusion. It is not a substitute but a cheaper alternative if you are on a budget. Another use for this mask that I am currently loving is a mid-week refresher. When I need to redefine my curls and set them again, this mask works as a light hair dress. Definitely, will buy this when I need to budget my money on hair care. I have my set curly hair care favorites. As a result, it is hard to get me to change up products. This testing of L'Oreal Paris Extraordinary Oil Curls products caused me to change conditioners. I will say this to L'Oreal as I do to other companies who want to tap into the core curl market: Join curly hair groups, check out Naturally Curly, Curly Niki, etc. to find out what ingredients in shampoo curly heads prefer. Right now, that shampoo is only going to be used by people who don't spend time and money on their curly hair care. Your conditioners are on point so keep up the good work there. 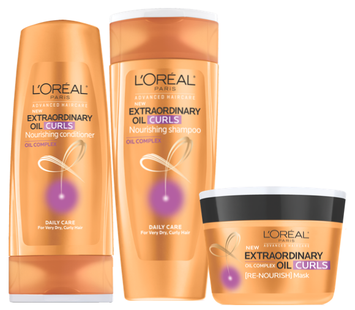 Have you tried any of the L'Oreal Paris Extraordinary Oil products, whether for curls or straight hair? How did you like them?